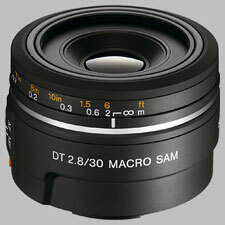 (From Sony lens literature) Sony 30mm f/2.8 DT MACRO SAM. Light, compact macro lens ideal for photography of flowers, insects and other small subjects. 1:1 magnification ration with 2cm minimum focusing distance for extremely clear, life-size closeups. This lens is not full frame sensor compatible. This light little 30mm f2.8 Sony macro lens is worth every penny it costs brand new at the Sony store. For such a low price, you can't beat its macro abilities. It makes a great "normal" lens back-up for my kit lens too, because of its range of apertures, small size and low weight, and its 45mm (equivalent) focal length, which I absolutely LOVE. In fact, I think it's the best focal length for a normal lens on the typical Sony cameras. I use it on a Sony A55. It focuses fast for a macro lens, and the auto/manual focus switch feels good and is easy to use. The switch has a very "positive" switch feel, rather than what you get with a lot of lenses from other companies. (I have owned a lot of lenses, because I've owned a Canon AL-1, Canon T90, Canon 20 D, Canon 5 D, a Nikon D5000, and a Sigma SD14.) I shoot with this lens at f8, f11, and f16 most of the time, so I get the best out of it. I am surprised how sharp it is. I am VERY happy with it. For the money, the quality feel is not bad at all. It feels about as good as my very good 18-55mm kit lens (which I also shoot mostly at f8 and f11), but just a little lighter maybe. This kit (Sony A55 with kit lens and 30mm macro) is ultra-light, and I couldn't be happier, though I am going to get a super wide zoom and a long telephoto soon, to complete my travel kit. This little lens gives a good angle of view, so I can shoot the inside of a flower or various other things. I have found it good for shooting bees, very small flowers (and parts of larger flowers, of course), and various other things up close, but it has a very short working distance when you are really getting into the macro range, where this lens lets you get really good close-ups. If you need to keep your lens more than a couple of inches from the subject, this may not be the lens for you. Try the inexpensive Sigma 50mm macro, or the more expensive Sigma 70mm macro maybe. I've read the Sony 100mm macro is good too, but I have not tried it. It's a bit pricey. The Tamron 180mm macro looks very good for about the same price as the Sony 100mm. Sometimes I wonder if I should have just bought an extension tube that is compatible with my kit lens, but the good ones would have been about the same price, and then I would not have a back-up lens. I think I would have had most of the macro capabilities I have with this lens though, so I think I will get a set of extension tubes and see, once I have a 70-300mm zoom to use them with.